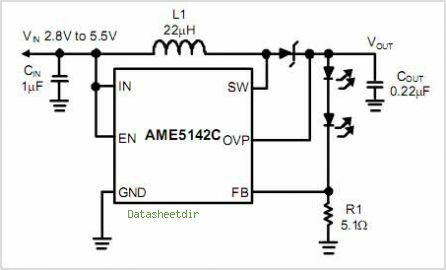 The AME5142C is a Boost DC/DC converter specifi- cally designed to drive white LEDs with a constant cur- rent. The device CAN drive 1 to 6 LEDs in series or mul- tiple strings from a Li-lon cell. Series connection of the LEDs provides identical LED currents resulting in uni- form brightness and eliminating the need for ballast re- sistors. The AME5142C switches at 1.2MHz, allowing the use of tiny external components. The input and out- put capacitor CAN be as small as 0.22mF, saving space and cost versus alternative solutions. A low feedback volt- age minimizes power loss in the current setting resistor for better efficiency. The AME5142C is available in SOT- 26/TSOT-26 packages. By AME, Inc. 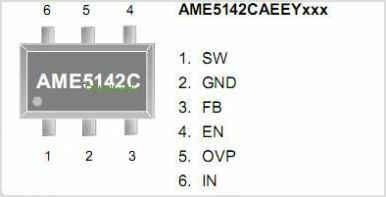 This is one package pinout of AME5142C,If you need more pinouts please download AME5142C's pdf datasheet. This is one application circuit of AME5142C,If you need more circuits,please download AME5142C's pdf datasheet.